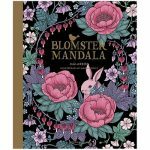 This beautifully intricate coloring book features dramatic animal drawings in lush backgrounds by the Fujiyoshi Brothers. 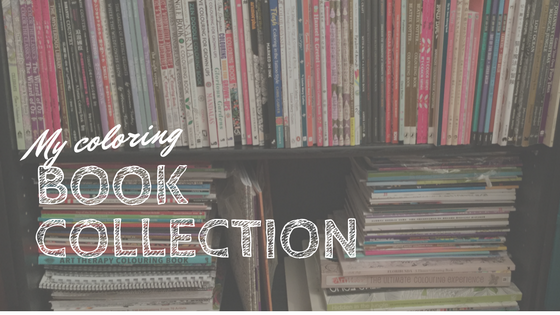 You will find stunning original illustrations of a panther, tapir, goat, lion, peacock, gorilla, zebra, and many more in this collection. 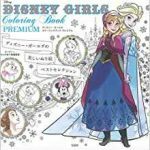 The book also features vivid coloring samples by the artists themselves, who are very popular in Japan. Their exotic illustrations of animals have been adopted in textiles, cushions, cups and stationery. 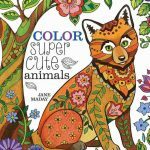 I hope you enjoyed the video review of Paradise of Animals Coloring Book (English Edition). 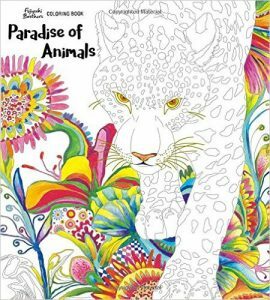 Paradise of Animals coloring book was first released in Japan under the same title last year. An English publisher then obtained the rights to the book and now we have an English Edition. It is always lovely when the original works can be printed in English, as it allows more people to enjoy these beautiful books who otherwise may not be able to access them. 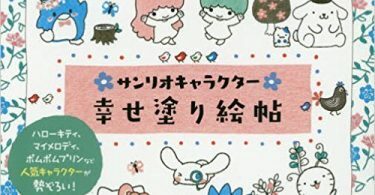 The Japanese cover of the book is virtually the same as the English edition with only a difference in text. The book has also been released as an oversized edition as well. When I seen an English version of the book was being released I was extremely happy. From my memory of the original version, that I flicked through in store, the book is the same, excepting the text translation. 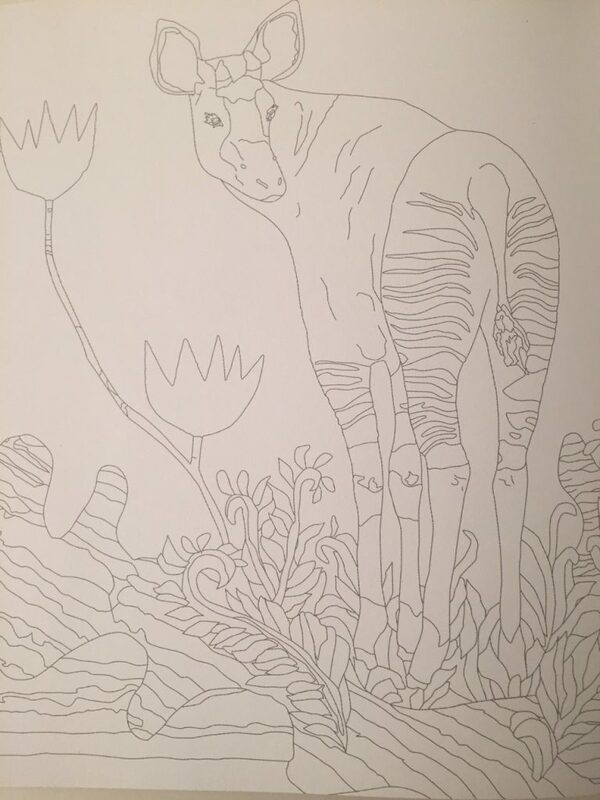 I see so many coloring books nowadays that I am surprised with myself that I didn’t buy the original version of Paradise of Animals when I first seen it. This book just knocks my socks off and challenges the way that I think about color. I love when I’m challenged to think differently and put aside my pre-conceptions. Doing a little research on the Fujiyoshi Brothers I learnt that they are two brothers who work together and collaborate on their art projects. In Japan they are very popular. 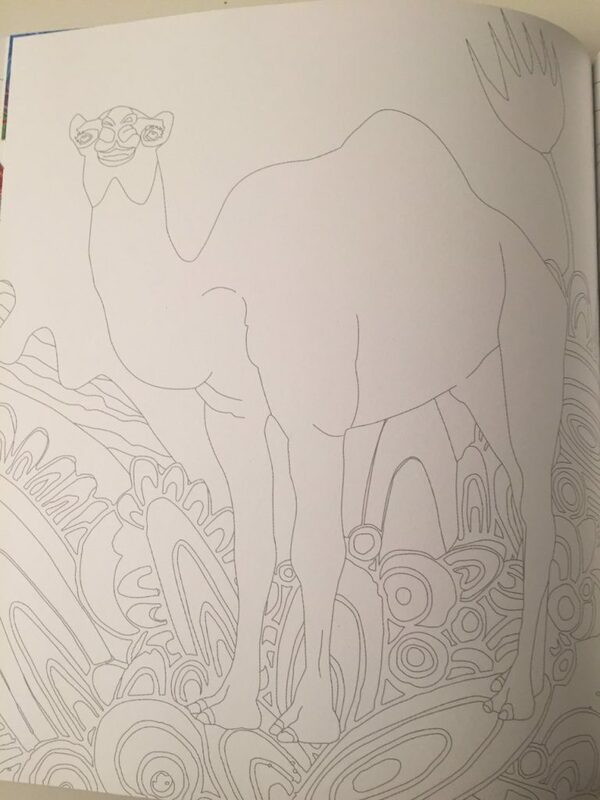 I’m ashamed to say that I was not familiar with their artwork until I purchased the coloring book. 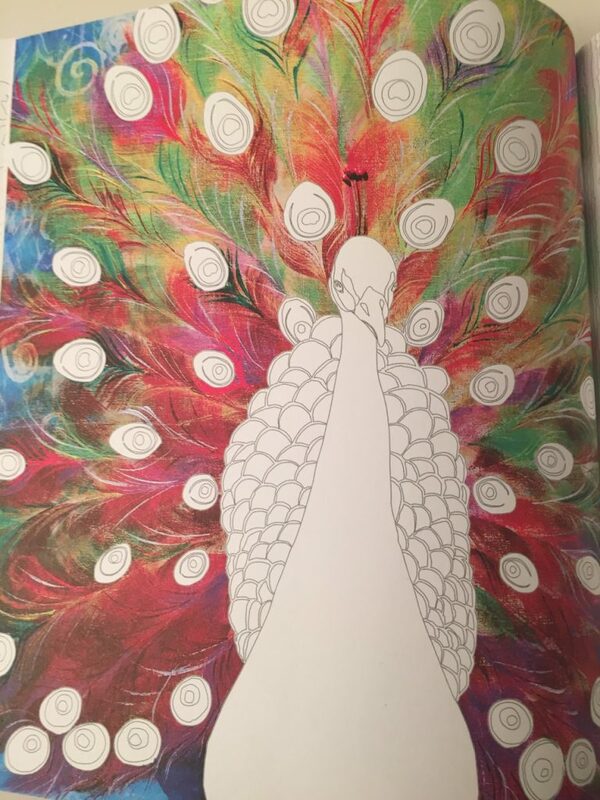 I love the way that coloring has reconnected me with art again and a more creative side than the corporate world I’ve spent most of my life in. 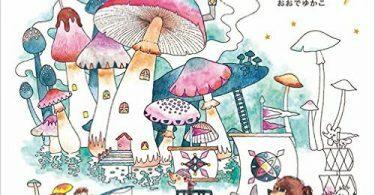 In Japan the Fujiyoshi Brothers have beautiful artworks for sale and swag including gorgeous bags and cushions. Their art work is so distinct with the vibrancy that it is natural that they would be in the home decor market. Check out their gallery or my Pinterest board for images of their art work. It is amazing the way that they use color. The cover of Paradise of Animals is what instantly drew me to it. So much vibrant color it looked like it had been colored with neon highlighters in some parts. The colored art work on the cover has the appearance that it was created with markers rather than a computer generated image. The beautiful line art has some pre printed color on the eyes and nose and whiskers have been gold foiled. 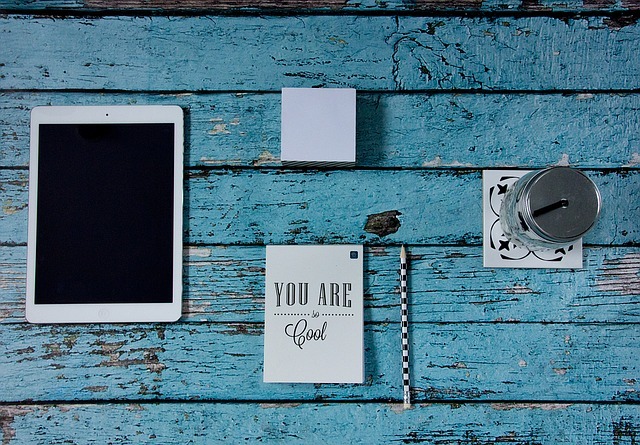 The balance can be colored by you. 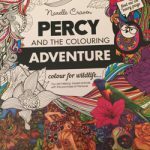 You will be guided in your color palette by the balance of the picture but that really is the point of the book it is vibrant and different like the art work that these drawings are derived from. 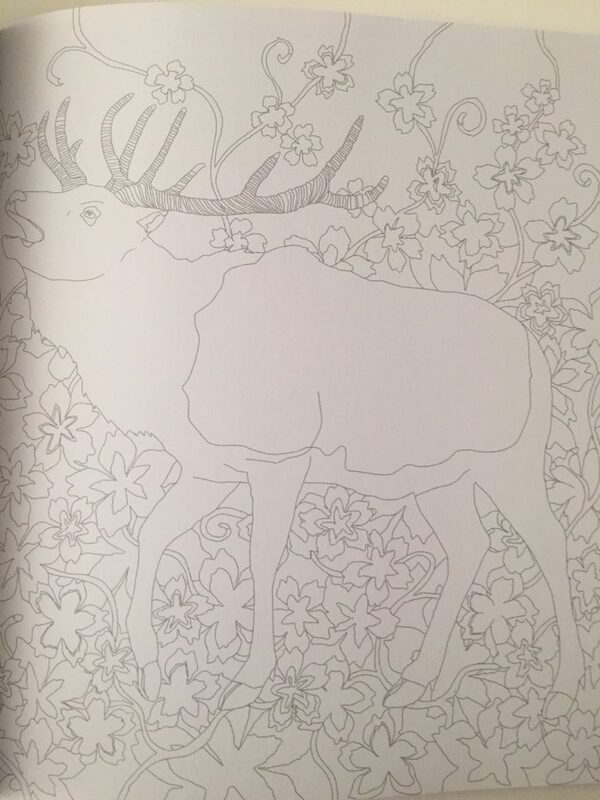 The back cover features a beautiful deer amidst some creative flowers. I love the way that it has been colored in pastels and neon looks. Like most of the art work I really enjoy seeing something colored completely differently from what I would expect and do. 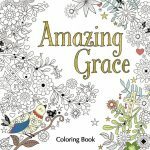 For me, this really introduces the fun into coloring and playfulness. 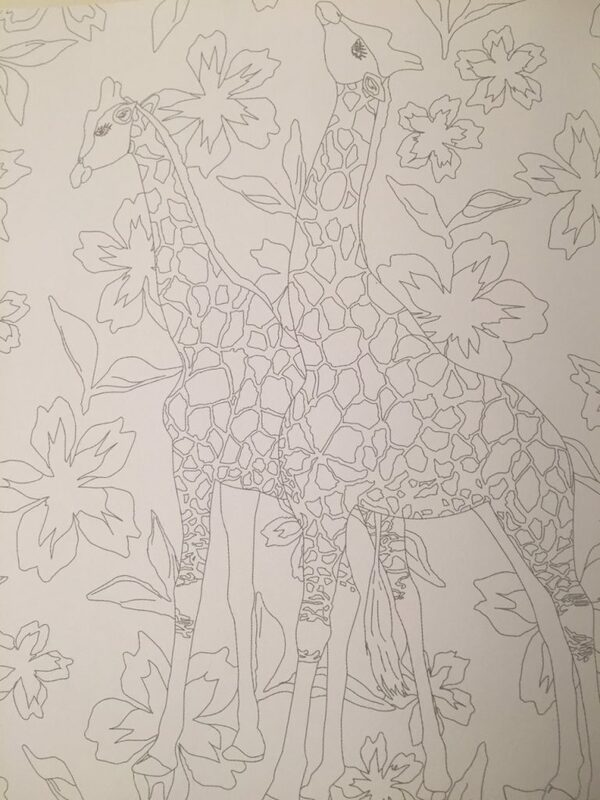 It makes me think of being a child when I could color whatever I fancied before rules were imposed. 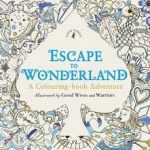 Of course, we can do that with our coloring books now, but this book just slaps me on the head with the concept and urges me to just do it and go for it. The book measures 25cm x 22.5cm and there is also an oversized version available. As soon as you open the book and see the bright yellow background with white lines and a simple title text you are introduced to color. 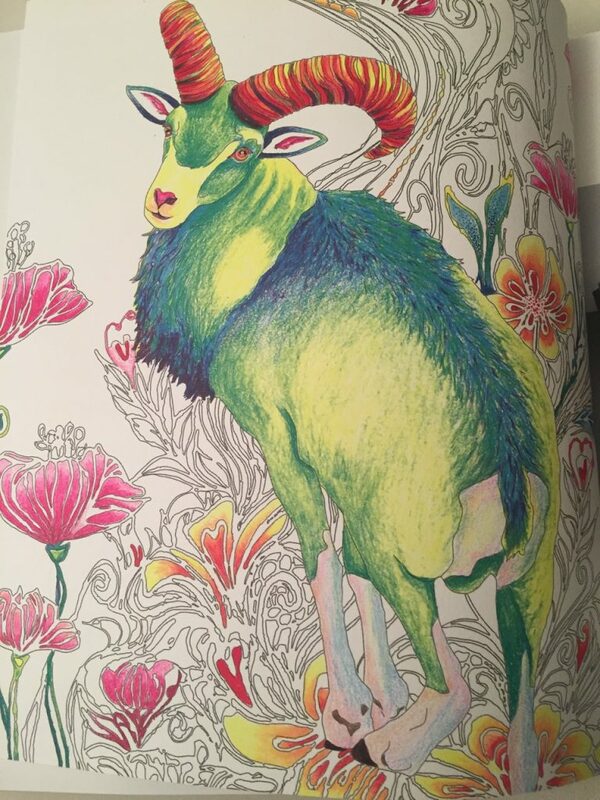 Over the page a billy goat colored in green, blue and bright yellow introduces you to this very different and almost psychedelic coloring book. 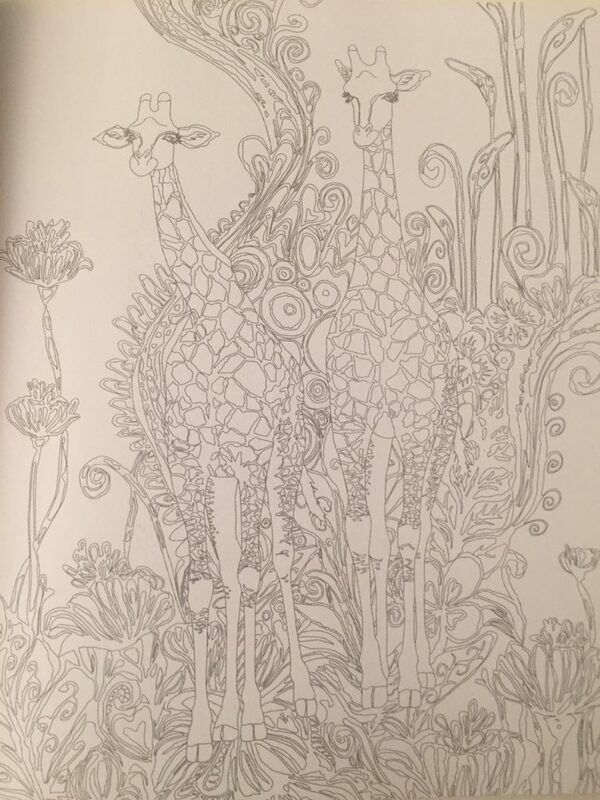 There is some line art on this page that you could color, but your palette will be restricted as some of the background flowers have already been colored. 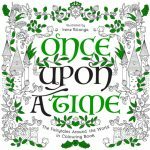 A page that sets out three framed colored images from the book plants the seed that the images in the coloring book are derived from original art works created by the brothers. A pink and white zebra follows with a background of geometric designs colored in (no, I have not been drinking …it really is pink 🙂 ). 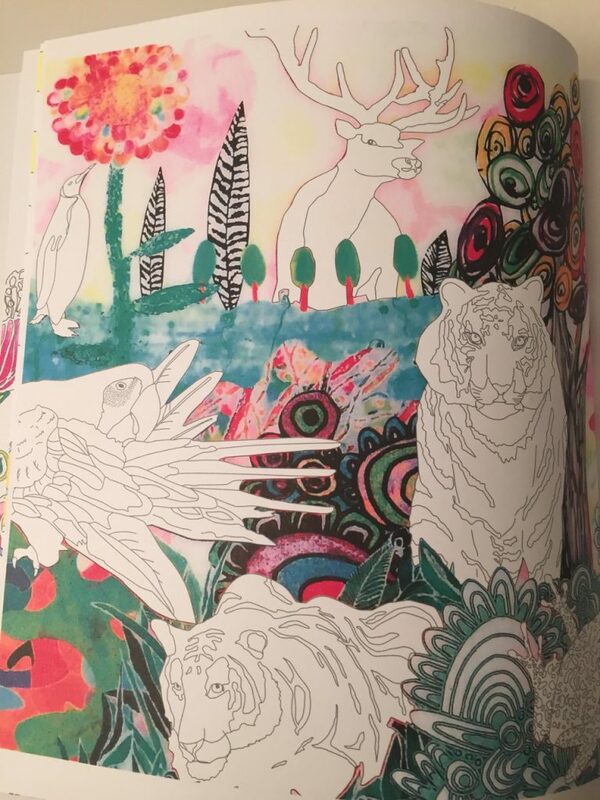 Following on are some close ups of the artists coloring a pink tiger and the pink zebra. More beautiful pages of their completed artwork follows. 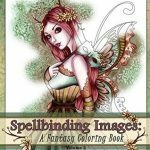 Two pages feature the bulk of the image colored in this very distinct palette with a few elements of line art left for you to color in each picture. At the end of the book is a little bit of text about the brothers and general copyright information. The colored images at the commencement of the book are so stunning I’m tempted to take an exacto knife to the book and cut some out to frame and keep. The illustrations have all been printed on both sides of the paper and are all orientated portrait style. The paper is white, medium quality and has a slight texture to it making it ideal for pencil layering. I wish that the illustrations had been printed on single sided paper or that an Artist’s edition of the book will be released, as they lend themselves to removal from the book and framing. 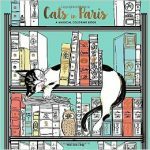 The illustrations comprise a multitude of animals. You will find penguins, peacocks, elephants, panthers, bears and more. 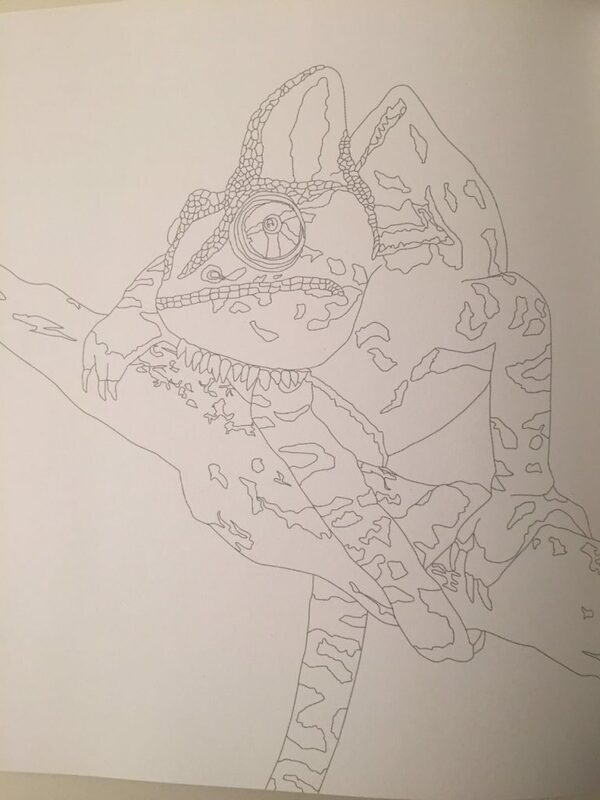 There are a few images where only part of the animal has been drawn for example portrait style but for the most part the whole of the animal is present in either side on profile or face on. Some of the illustrations have a pre colored background. Excluding the ancillary pages, there are approximately 4 images with a vibrant background already provided. Some colorists may feel restricted in their color choice due to this decision. 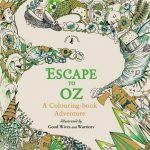 The line art is grey and crisp and quite fine throughout the book. I am finding it easy enough to see without my glasses on but for some colorists with minor visual impairment they may find they will need a magnifying lamp to work on the book. I think the idea behind the fine, grey line art is that the completed artwork would then represent more of a painting than an outlined image. The front cover depicts this “painterly” style. Some of the art work has a lot of detail which may prove challenging if you have health and visual impairment. Fortunately, there are a number of images throughout the book that have larger spaces and open areas to color, in which would suit colorists of all types. Approximately half of the book has images with background or other detail on it pre printed or precolored. The remainder of the book often has images that would really benefit from a bit of background jazzing up. Some of the precolored images that have been provided in the book could serve as background inspiration for other parts of the book. Illustrations both single sided and double sided do merge into the spine of the book where it is a little tricky to color. With some continuous pushing on the spine of the book, it should relax enough to color these areas. Please click on the images below to view Paradise of Animals in more detail.